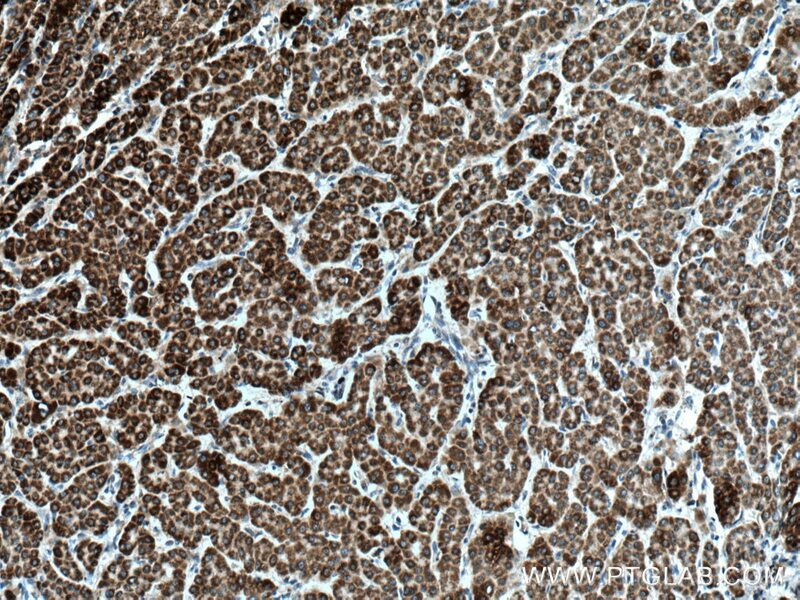 Immunohistochemical analysis of paraffin-embedded human liver cancer tissue slide using 15417-1-AP (BDH1 antibody) at dilution of 1:200 (under 10x lens) heat mediated antigen retrieved with Tris-EDTA buffer(pH9). 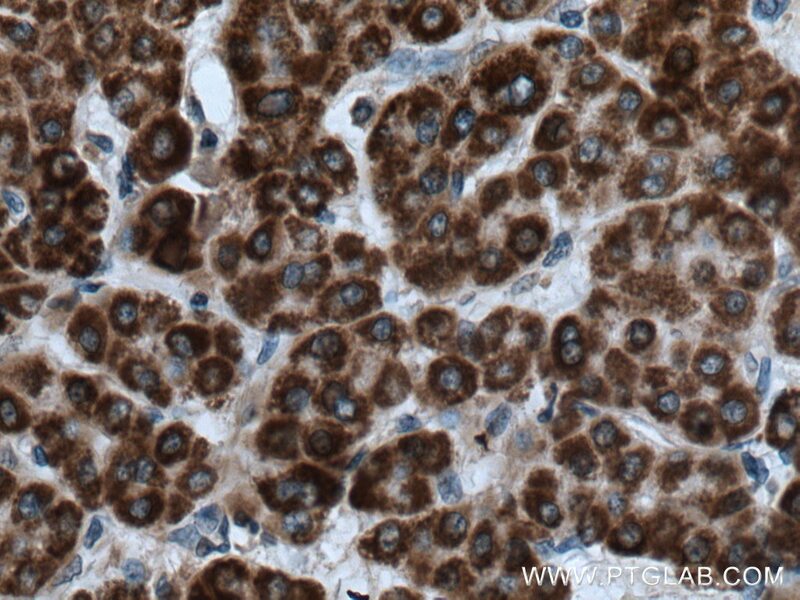 Immunohistochemical analysis of paraffin-embedded human liver cancer tissue slide using 15417-1-AP (BDH1 antibody) at dilution of 1:200 (under 40x lens) heat mediated antigen retrieved with Tris-EDTA buffer(pH9). 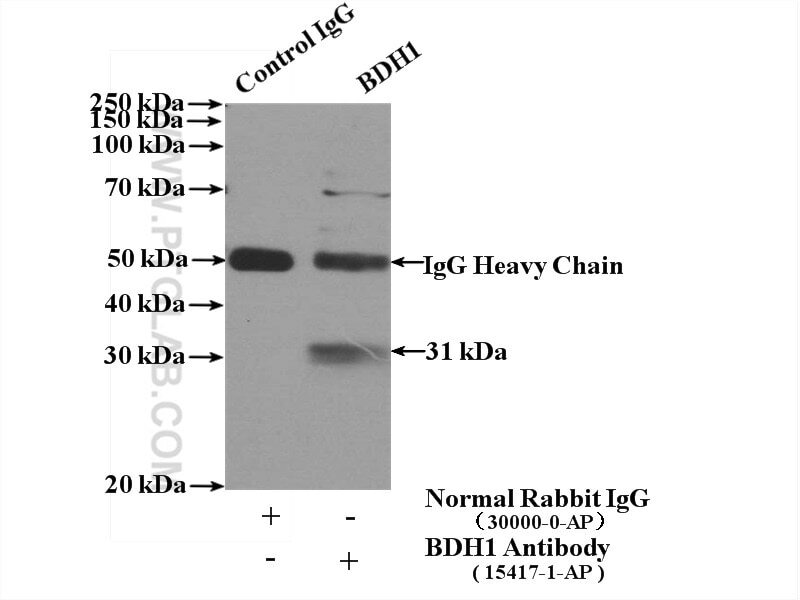 IP Result of anti-BDH1 (IP:15417-1-AP, 4ug; Detection:15417-1-AP 1:300) with mouse liver tissue lysate 4000ug. 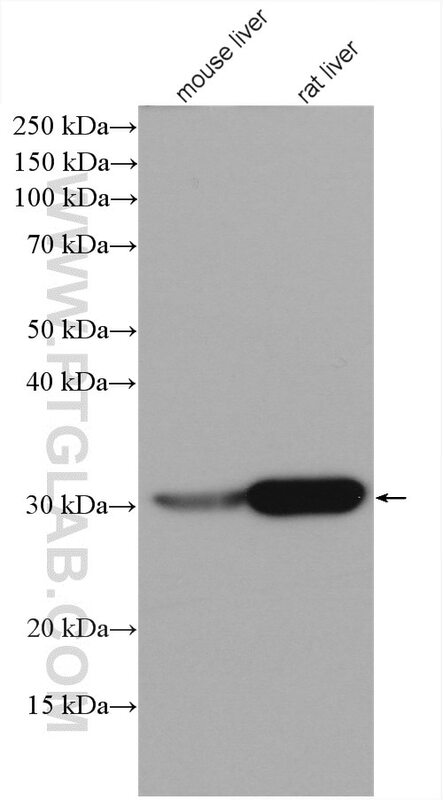 BDH1 (3-hydroxybutyrate dehydrogenase, type 1) is a 343 amino acid protein that localizes to the mitochondrial matrix and belongs to the short-chain dehydrogenases/reductases (SDR) family. The deduced 343 amino acid protein contains a 46 residue leader peptide, which is cleaved to produce the mature form. It is a lipid-requiring mitochondrial enzyme with a specific requirement of phosphatidylcholine (PC). Impact of Peripheral Ketolytic Deficiency on Hepatic Ketogenesis and Gluconeogenesis during the Transition to Birth. Impairments of hepatic gluconeogenesis and ketogenesis in PPARα-deficient neonatal mice. Hepatocellular carcinoma redirects to ketolysis for progression under nutrition deprivation stress.